While sound healing practices have been around forever, Andrew Clark rides the wave of a new frontier by merging ancient wisdom with modern technology and his natural ability to make music. 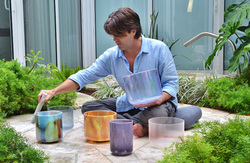 With the magical, hypnotic sounds of crystal sonic bowls and the concept of live vibration healing, Andrew founded 1111 VIBES, the first center of its kind in Miami Beach at the world class 1111 Lincoln Road Studios. Out of thin air he raises a vortex of pure vibration and something stirs within you. His restorative sessions create profound relaxation as the sound waves stream through like a sonic quickening that integrates the body and clears the mind for an experience that is truly beyond words. Andrew is a healing artist, grounded by the presence he shares through music and certified in Structural Integration, as a Reiki Master and Yoga Instructor. Over the years, he has immersed himself in scientific, artistic, somatic and spiritual healing, eventually experimenting with the vibration of pure crystalline tones to bring the body into harmony with itself and the greater flow of gravity. Healing is natural in this unified state. As he gradually shifted his emphasis into music, Andrew developed Crystal Sonic Healing™ to integrate the potential of sound & vibration into the more traditional practices of bodywork & movement/yoga.